Kaga church: a little gem! My original plan was to visit the little church of Risinge, which is famous for its beautiful fresco's. Unfortunately this early in the season (early May) the S:ta Maria Church in Risinge isn't open to the public, so you can imagine my disappointment. But I stumbled upon some good news while doing research for this trip! I discovered that the little church of Kaga was decorated by the same painter as the Risinge church. So without hesitation I added Kaga to my travelplans. And I can say I wasn't disappointed! This church is a little gem! 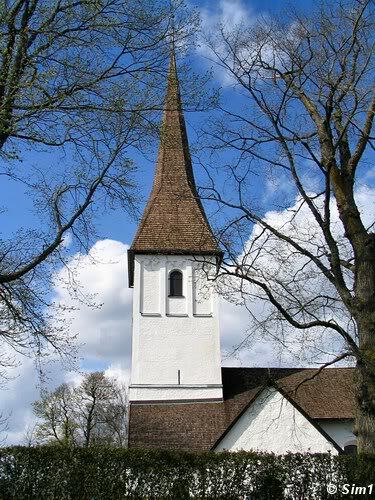 the Kaga church was built by King Sverker (d. 1156) on the old pagan cult site of Allguvi. On the outside it is a small white church, quite elegant with it's high tower. On the inside you will be surprised by the painted valves giving this little church a special atmosphere. The church itself dates back to 1156, but most likely there has been a church previous to this one. The present spire was added later to the church, most probably in the 15th century. Kaga church and is one of the best preserved churches in Östergötland from the Middle Ages. The church frescos are from two epochs: late Romanesque and late Gothic times. The frescos of the nave are made by a successor to the artist named the Risinge-master, who is named after his most important work: the frescos in the Risinge Old Church. 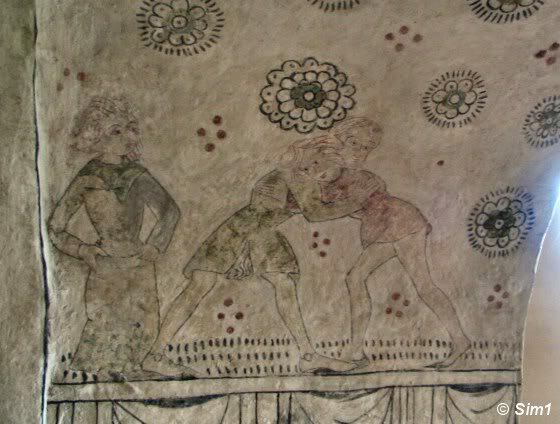 These frescos are dated to the period around or just after the mid 15th-century. The paintings in the chancel are made by the master himself. 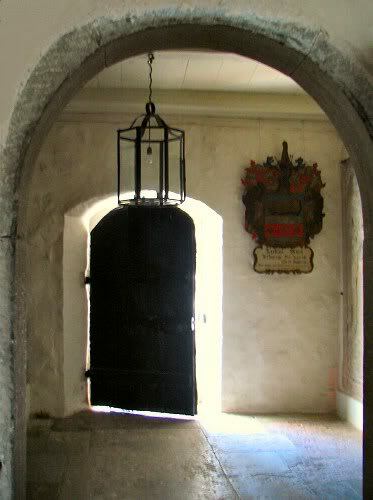 In the photo you can see the fresco on the arch to the belfry room. Kaga is located in the middle of Sweden in the region of Östergötlands Län. It is on the eastern side of the big lake Vättern, not very far from the city of Linköping. The highway E4 (from Stockholm to the south west of Sweden) brings you very close to Kaga. Make sure you take a good look at the map before you drive here, otherwise it might be tricky to find.